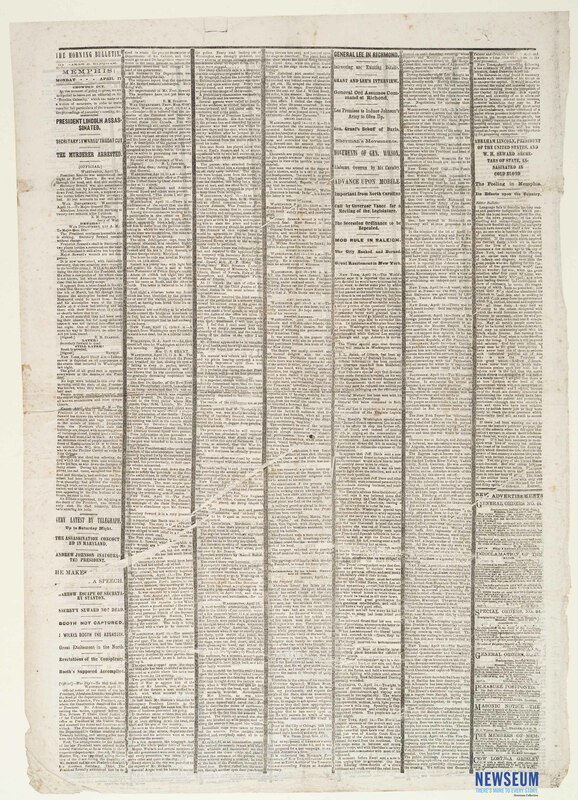 The front page of this Union-occupation newspaper from Memphis, Tennessee provides details of the assassination of President Abraham Lincoln and the attempted assassination of Secretary William Henry Seward. Included are dispatches from Secretary of War Edwin M. Stanton to Major General John A. Dix. Additional articles report falsely on the death of Seward and the capture of John Wilkes Booth. Further reports detail Andrew Johnson‰Ûªs inauguration, the murder of an Illinois copperhead for rejoicing in Lincoln‰Ûªs assassination, the speeches of Maj. Gen. N.P. Banks and Lieut. Governor of Illinois William Bross, the search for the assassins, and a report that John Surratt is the suspected attacker of Seward. In the far right column is an editor bulletin. Known as "mourning rules," the wide vertical lines between the newspaper columns represent grief over the loss of an important person.